We are currently living in Washington state and boy does it like to rain here! After living in Georgia for a couple years my kids got used to being able to go to the park almost everyday. Now we get lucky if we can go to the park twice a week. So we have to get creative and think of indoor motor activities to help spend their abundance of energy. 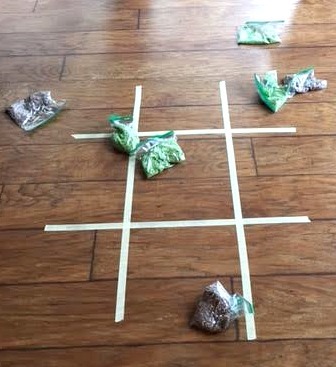 One of the recent activities we did, from the activity sticks, was tic tac toe toss. Both my two year old and my four year old loved this fun game and I loved that it got them ready for a long nap! 1. 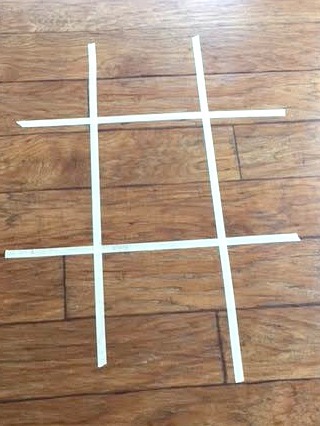 Set up the tic tac toe board with masking tape on the kitchen floor. 2. Put together your rice bags. I was originally going to buy some small bean bags from the store but to get them in different colors was a lot. So to save money and to save having to wait for Amazon to ship them to me I made my own. First I colored the rice (a link is provided above where you can learn how to do this) in two different colored batches. 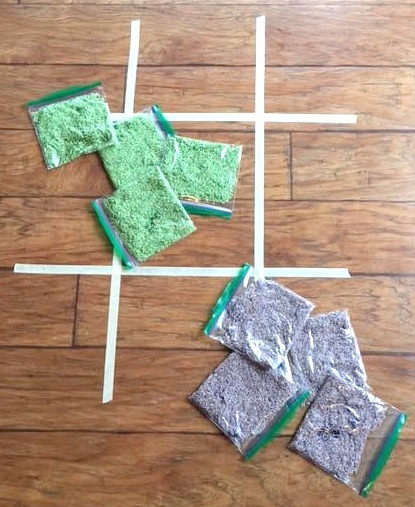 Then I added rice to Ziploc bags and gave each child their own color. This ended up being a lot cheaper than buying than from the store and we threw them in the activity box for later. My son, who is two, didn’t quite understand what we were doing. My four year old daughter on the other hand loved this giant version of tic tac toe. 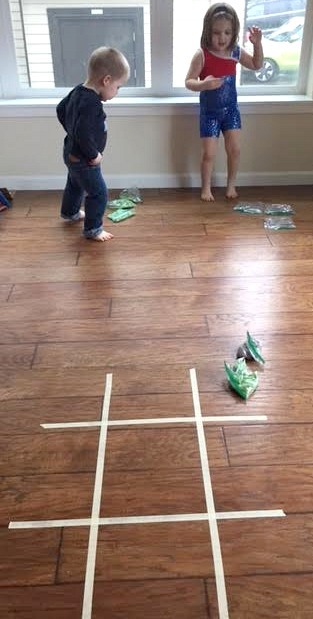 They both had fun trying to aim into each box. Then they would run and grab their bags to start a new game. This did a great job at using up energy on rainy PNW day! What is your favorite rainy day activity to do with your kids?